Measures: 3" x 10.5" x 10.5" / 7.5cm x 26.5cm x 26.5. Bake cheesecakes, coffee cakes, quiches and more! Three different size pans in set, 9"/23cm, 10"/25.5cm and 10.5"/26.5cm. Durable steel construction with nonstick coating for effortless release and easy cleaning. Spring latch securely holds form together offering a tight leak proof seal. 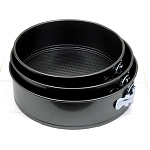 Norpro SPRINGFORM PAN, TIN, 8"
Norpro SPRINGFORM PAN, TIN, 9"